Many cities around the globe are home to underground art movements — those whose participants eschew the strictures of modern day gallery wine and cheese, curated exhibits, and formal public art shows. Paris has gone a step further — though deeper, would be more correct — in providing a subterranean home for some truly underground art and the groups of dedicated, clandestine artists, hackers and art restorers. Wired spent some quality time with a leading group of Parisian underground artists, known as UX, for Underground eXperiment. Follow Wired’s fascinating and lengthy article here. 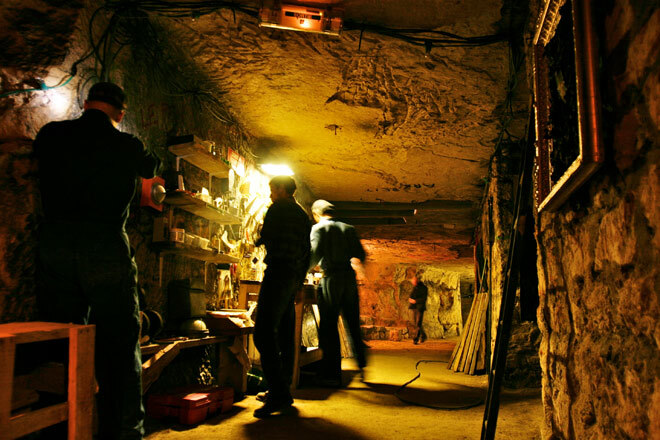 The obsessively secretive members of an underground art collective have spent the last 30 years surreptitiously staging events in tunnels beneath Paris. They say they never ask permission – and never ask for subsidies. We’re standing nervously on the pavement, trying not to feel self-conscious as we furtively scrutinise each passer-by. After weeks of negotiation, we have a meeting with someone who says he is a member of the highly secretive French artists’ collective – UX, as they are known for short – outside a town hall in the south of Paris. It is late on a Sunday night but the street is still quite busy. Finally I notice a young man dressed entirely in black apart from a red beret and a small rucksack on his back. He hovers for a moment and then motions us to follow him. Our destination is the catacombs, the tunnels that run beneath the pavements of Paris. I stare down a seemingly endless black hole before stepping gingerly on to a rusty ladder and start to clamber down. There are several more ladders after that before we finally reach the bottom. To my great relief, there are no rats – we go deeper than the rats ever do – but it is pitch black and very wet. The water is ankle deep and my shoes are soaked through. “It’s fine, if you’re properly dressed,” laughs Tristan as he splashes ahead in his rubber boots. Using the flashlight on my phone, we do our best to follow him. Along the way I notice some colourful graffiti and a painting of an evil looking cat. After a few minutes, we reach a dry, open space with intricate carvings on the wall and it is here that we finally sit down to interrogate our mysterious companions. Tristan explains that he gets a kick out of getting to places, which are normally off-limits. He is a “cataphile” – somebody who loves to roam the catacombs of Paris. UX are not the only people who go underground. There is a rap song about cataphiles, people who would rather don the rubber boots of a sewer worker (egoutier) than go clubbing in a normal night spot. There have been a number of raves underground – some chambers are said to be big enough to hold 1,000 people. The galleries are turned into makeshift night clubs, with a bar, lighting effects, and DJ turntables, using electricity diverted from the Parisian metro. He also climbs on the roofs of churches. “You get a great view of the city, especially at night and it’s a cool place for a picnic,” he says. Tristan who is originally from Lyon says his group is called the Lyonnaise des Os – a reference to the piles of bones (“os” is French for “bone”) in the catacombs – but also a pun on France’s famous water company, Lyonnaise des Eaux. He and his group spend their time exploring the tunnels, and carving sculptures. The UX are a loose collective of people from a variety of backgrounds. Not just artists but also engineers, civil servants, lawyers and even a state prosecutor. They divide into different groups depending on their interests. The Untergunther specialise in clandestine acts of restoration of parts of France’s heritage which they believe the state has neglected. There is also an all-women group, nicknamed The Mouse House, who are experts at infiltration. Another group, called La Mexicaine de Perforation, or The Mexican Consolidated Drilling Authority, stages arts events like film festivals underground. They once created an entire cinema under the Palais de Chaillot, by the Trocadero, with seats cut out of the rock.